We are off to a good start and thank you to everyone who helped with our PBS Wildcat Boot Camp today. We will do this each morning at 8:30am this week. We will not have early morning PE or Counseling this week. They will both start again next week. We have no new students as of today! 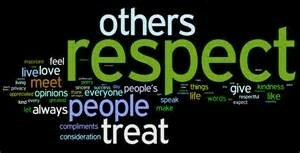 Our January Character Trait is Respect. We will look for respectful students all month and talk about respect during morning assembly each day. "Some people grumble because roses have thorns. I am thankful that the thorns have roses."